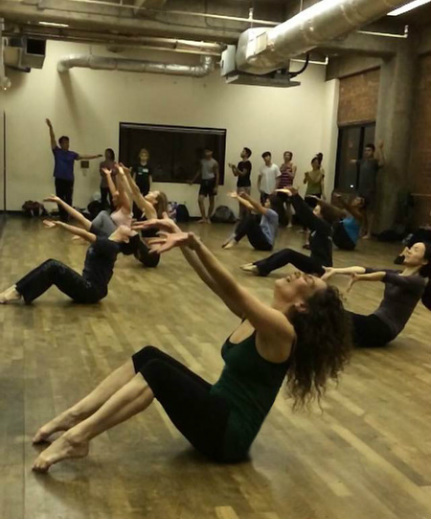 Drawing from her training in classical ballet, modern and Luigi jazz techniques, Terri Best's class is influenced by, and rooted in each of these three traditions. Class begins with release work, gentle stretches and isolations. This is followed by a center barre, with emphasis on the fundamentals of ballet technique. Floor exercises are designed for deeper stretches, practice of Graham contractions and for core strengthening through abdominal work. We move into space with progressions, which include traveling steps, turns and jumps, the practice of which prepares the students for proper execution of those technical elements within the context of the choreography. The combination is a choreographed phrase that includes elements of everything we have worked on throughout the warm-up: Contractions and release work, floor work, extensions, turns, jumps, isolations, and gestures. Emphasis is on movement motivation (moving from the inside out), musicality, shape and line, flow, attack and use of the breath. Students are encouraged to not merely imitate the movement, but to find within themselves an impetus for the honest physical expression of the passion, joy, or whatever emotion the music and choreography may suggest or inspire. The learning environment is supportive and encouraging - never judgmental or competitive - which allows every student, whether they aspire to dance professionally or recreationally, to feel supported in taking the risks that will enable them to grow, and to become articulate, passionate and fearless movers. Terri is the honored recipient of the 2008 Stanley Holden Award for distinguished teaching, presented by Edward Villella at the 9th Annual Los Angeles Dance Invitational. She has been on faculty at EDGE Performing Arts Center since 1993, and conducts master classes and workshops throughout the U.S. and abroad. To inquire about Terri's availability to teach single classes, workshops and intensives, please e-mail: terri@terribestdance.com. has become, over the years, a necessity for my growth - not just as a dancer, but as a performer and teacher as well."